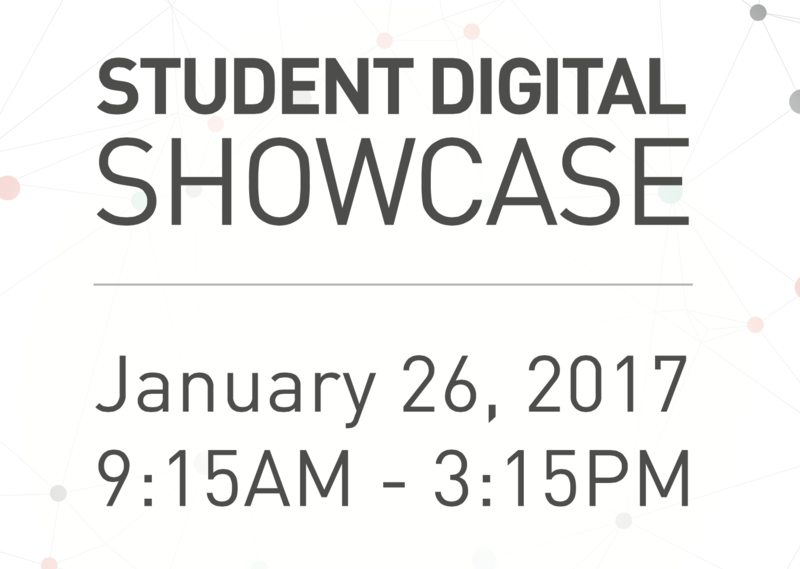 On January 26, 2017, the SFU-UVic Digital Pedagogy Network hosted a one-day Student Digital Showcase at SFU Harbour Centre in Vancouver. This event brought students in English and Publishing departments from Simon Fraser University, the University of Victoria, and the University of Toronto to present their digital humanities research, projects, and pedagogical practices. The day started off with a panel on online collections, with SFU publishing student Alessandra Bordini showing participants her web-based collection of the works of Renaissance publisher Aldus Manutius. SFU English student Deanna Fong introduced participants to her Fred Wah Archive, an online collection of the poetry of Fred Wah. Fong’s project was inherited from a resource at York University, and her “reboot” of the digital resource, along with Bordini’s collaboration between SFU Publishing and SFU Library’s Special Collections and Rare Books, led to a discussion of the important role libraries play in hosting, supporting, and facilitating digital projects. The next panel was on digital maps, and featured presentations by Ashley Morford from UToronto English and Alix Shield from SFU English. Both presenters used E. Pauline Johnson’s Legends of Vancouver to demonstrate the potential of digital mapping. For Morford, Legends provided a way to spatially recover Indigenous histories of Vancouver that had been obscured by colonial mapping. For Shield, mapping Legends highlighted the significance of Chief Joe Capilano’s narratives and the potential to recover them spatially. A lightning round featured five minute presentations on student projects, some of which began in SFU English classes with Dr. Colette Colligan and Dr. Michelle Levy. Reese Irwin from SFU English discussed her digital edition of Jane Austen’s last, unfinished work, Sanditon; Kendal Crawford from SFU English and Publishing presented her review of the William Blake Archive; Kate Moffat from SFU English presented on her Story Map of Jane Austen’s Pride and Prejudice; Mariella Ocampo from SFU English demonstrated her hypertext of Oscar Wilde’s The Picture of Dorian Gray; and Donna Langille, Leah de Roy, Erin Huxley, and Keirsten Mend from SFU English and Publishing discussed their video on the underground Victorian novel Teleny. The afternoon continued with a panel on digital skills training, with a presentation from UVic English’s Tiffany Chan and UBC’s David Gaertner on the possible exclusionary discourses and practices of DH. The two offered suggestions for making exclusionary politics visible and challenging them through pedagogical and community practices. Then UVic English student Caroline Winter offered her perspective on the way her work in the digital humanities complemented and changed her traditional research practices. The next panel featured digital tools created by students, including a TopoText literary mapping tool created by UVic English student Randa El-Khatib in collaboration with Computer Science students. SFU Publishing’s Erik Hanson presented a social media survey designed to create possibilities for qualitative, rather than just quantitative, analyses. Abdul Zahir from the SFU English department discussed his role in the development of Dr. Colette Colligan’s Digital Writing Revision Tool an online resource designed to help with the writing revision process. The last panel of the day was “Research-Integrated Pedagogy.” UVic English student Catriona Duncan discussed how her work as an RA on the The Map of Early Modern London has influenced her own research, helped her develop DH skills, and provided her with opportunities for collaboration. SFU English’s Kandice Sharren discussed her work as the project manager for the Women’s Print History Project, raising important questions about the democratization of work in DH projects and the organic development of best practices. The day ended with discussion about future possibilities for networked learning. There was great participation on Twitter throughout the day – for more comments and perspectives, check out our Storify of the event.